There is never a right or wrong time to start a business, but starting one in today’s economic climate, could prove beneficial in the long run. This is the view of leading entrepreneur, Professor Michael McQuillan. As one of the leading figures in the Northern Ireland hospitality industry, Professor McQuillan is co-founder and Managing Director of the streat cafÃ© chain and streat Franchising Ltd. 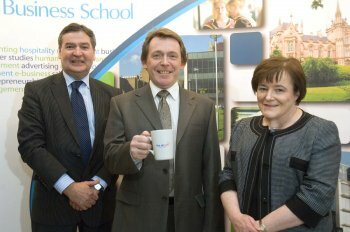 Professor Michael McQuillan, was speaking at the University of Ulster’s Belfast campus where he delivered the Ulster Business School’s latest Celebrating Business Enterprise Lecture. During his address, Professor McQuillan outlined the three main things needed to succeed in business. “The most important things to help you succeed are courage, we need courageous people to take the first steps; clarity of purpose in what you want to achieve; and investment, people to invest in the dreams and focus of other people,” Professor McQuillan said. “There is never the right or wrong time to start a business. When I started, I jumped in with a vision of what success looked like. Professor McQuillan’s innovative franchise concept has attracted national acclaim by being the only franchise to win the prestigious UK national training award. Welcoming his participation in the Ulster Business School’s Celebrating Business Enterprise Lecture series, Professor Marie McHugh, Dean of the School, said that Professor McQuillan’s lecture was an inspiration to budding new entrepreneurs and would certainly encourage and re-energise many people in business who are grappling with the challenges posed by our current economic environment. Professor McQuillan, is a visiting professor of the Ulster Business School, and Chairman of the Northern Ireland Hospitality and Tourism Industry Representative Forum, People 1st. He said that support in education and the business community is crucial for those starting out an enterprise and that you don’t have to be born with the entrepreneurial gift but it can be grown. “From early on I tried to punch above my weight through education, and my early career and I always had the desire to create and build a new business,” Professor McQuillan said. “Some people are born with something very special, but an entrepreneurial spirit can be developed in people. It is a lot about attitude. People can come to a crossroads in their lives, their business lives, and can either chose not to take that chance or they can chose positively.